There's still gold in them thar hills. A century and a half after the torrent of gold-seekers to the California Sierras dried up, the flow of historical studies of the development of property rights on the gold frontier continues unabated. This work of detailed scholarship by Mark Kanazawa, an economic historian who has published extensively on water law in the western United States, is the latest entry into the auriferous regions. Golden Rules takes an economic approach to understanding the origin and evolution of water law in the California mining region in the decade or so following the discovery of gold at Sutter's Mill. After several substantial introductory chapters laying out the history of California gold mining and the ditch industry that developed to provide the water used in increasingly large and sophisticated mining operations—as well as the economic theories of property and tort he believes explain the historical development of the law—Kanazawa gets down to his analysis in detail. Chapter 5 examines the water rules adopted in the mining camps, arguing that they generally did a good job of promoting mining at an efficient scale. Chapter 6 discusses how economic forces gradually pushed disputes over water from the informal mining camp system to the official courts of the state. Chapter 7 argues that the appropriation doctrine as it developed in the California gold fields was economically efficient. 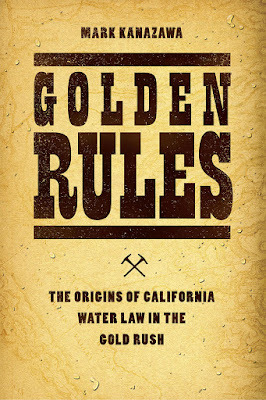 Chapters 8 and 9 turn to legal issues often ignored in both gold rush histories and the legal history of water—the regulation of water quality and damage caused by bursting dams—arguing that with regard to these, too, California law provided efficient solutions. Where many earlier studies drew something of a caricatured portrait of the legal doctrines adopted in the mining camps and later in the courts, for instance, seeing a sharp jump from riparian rights to the appropriation doctrine, Kanazawa's book makes admirably extensive use of primary sources—including trial court documents and contemporary newspaper accounts—to paint a detailed picture of complex and uneven legal development, often varying from one subregion to another and from one year to the next. Quantitative data and analyses, sometimes with supporting equations, are supplemented by in-depth discussions of particular ditch companies, court cases, and miners’ experiences. That being said, this is legal-economic history of a certain sort, of the genre Daniel Klerman has termed “law as the dependent variable” (Economics of Legal History ). As Kanazawa states, his goal is to understand water law's “underlying economic determinants”; “the objective is to come up with a reasonable economic interpretation of the legal principles that emerged” (pp. x, 185). The strength of the book lies in its careful exposition of variations and uneven development in the law, but every complexity is ultimately interpreted as the necessary result of the economic forces in play. If you like your history neat and deterministic, with little room for chance, politics, or social functions other than wealth maximization, you'll feel at home with this book. If not, the monochromatic filter might cause some irritation. Nonetheless, Kanazawa's careful exposition of historical legal developments makes this book useful and interesting for anyone interested in the evolution of property, tort, and environmental law. Business historians will be interested in the book's exploration of the growth of ditch companies and their corporate organization in frontier conditions, as well as of the key role ditch companies played in the development of the law. This is a great blog you have, thanks for sharing!